Version 3.5.3 of OpenSF has been released and can be downloaded here. Version 3.5.2 of OpenSF has been released and can be downloaded here. Version 4.12 (C, C++, Java Libraries) of the Earth Observation Mission CFI Software (v4.X branch) has been released and can be downloaded here. Support for Earth Observation Ground Segment File Format Standard version 3. 647: targetReflected method: unexpected fail. 655: targetInter method: memory leak in Java API. 658: Error/Warnings reading Doris files for Sentinel-3. (this problem has been reported by the Sentinel-3 IPF Team). Version 3.5.1 of OpenSF has been released and can be downloaded here. Improved compliance with ESA generic E2E simulator ICD Issue 1.2.1 (e.g. naming of Timeline configuration xml parameters). 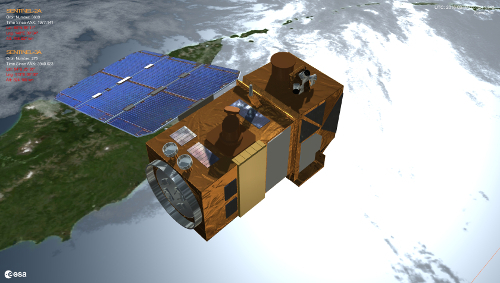 Version 1.1.2 of SAMIEdit (SAtellite MIssions 3D visualisation application) has been released and can be downloaded here.